Selfies can be a small act of self-promotion, but it's nothing compared to what artist Matthew Mohr can do for you. 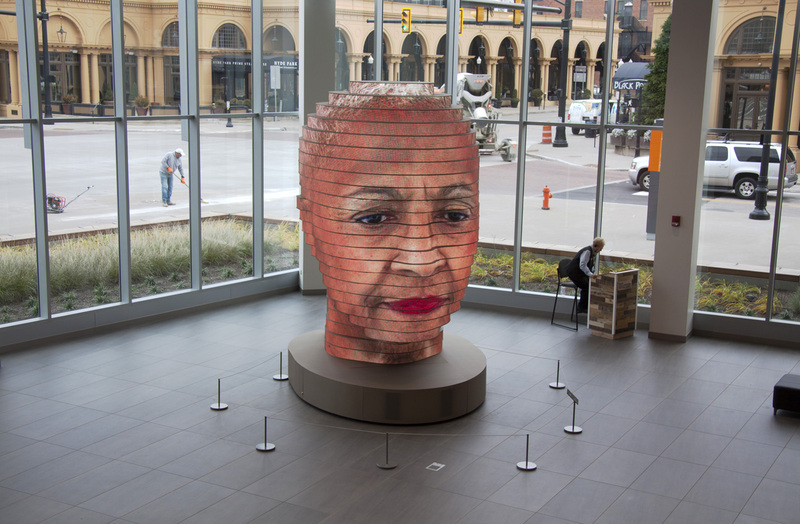 He has built a sculpture called As We Are that projects your face onto a 14-foot high interactive sculpture at the Columbus, Ohio convention center. "It is an open-ended, conceptual piece that explores how we represent ourselves individually and collectively," Mohr said in an artist's statement. "As We Are presents Columbus as a welcoming, diverse culture where visitors and residents can engage on multiple levels." Mohr came up with the concept and several companies executed the engineering and fabrication, LED displays, 3D scanning, photogrammetry, and diversity research and branding. As We Are is built with 3,000 custom designed LED displays, with over 850,000 lights in total. The panels are wrapped 360-degrees around a head-shaped skeleton, with the tightest radius at the bridge of the nose. The sculpture cost around $1.4 million, according to the Columbus Dispatch. At the back is a photo booth with 32 digital cameras that can capture your head from any angle. If you decide to brave the experience, you can enter and take snaps until you get one you like. The system will then process your 3D doppleganger and project it onto the installation in about three minutes. The head shape is based on the average human head across multiple cultures and ethnicities, so the "selfies" don't look exactly like the subjects. "It's amazing how people have different reactions to it -- some are wowed, and some are taken aback, and some are having a mini existential crisis," Mohr told Architects and Artisans. "But by and large, most people love it; it's fun, but it's really an intense experience." Columbus' convention authority hopes that the installation, along with other artworks, will make the center more attractive both to tourists and locals. When not giving participants an exhibitionist-like thrill, it displays the diversity of the city by showing previous portraits "based on a range of skin tones," according to Mohr. By putting seemingly insignificant moments like selfies on such a large scale and in public, it also functions on a higher level. "The experience of seeing one's portrait on a fourteen foot, 3D head in a public place may be daunting to some and brings to question our willingness to share." Mohr notes. "It is intended to provide amusement and evoke larger discussions around the phenomena of social media, diversity, and the power dynamic of public art."